Tripp Lite's 16-Port NetDirector 1U Rackmount Cat5 KVM Switch, is the next generation of our cost-effective, feature rich, KVM switches. 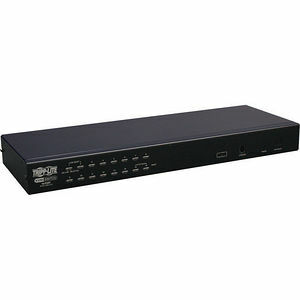 It's sleek, 1U design and compact size, features RJ45 connection ports that utilize inexpensive Cat5 patch cables, reducing the amount of cable clutter normally found with traditional KVM cabling. Easily switch between CPU's with Push Buttons, Hot-Key commands, or built-in On Screen Display (OSD) menu function. Daisy-chaining allows connection to up to 512 computers. Compatible with PS/2 and USB computers, VGA, SVGA, or XGA monitors, as well as the following OS platforms: DOS, Windows (all versions), LINUX, UNIX, HP UX, and SUN. Supports both PS/2 and USB Mouse and Keyboards into the switch. Constructed of heavy-duty steel housing. 1 year limited warranty.